Personal recommendations to help you make the most of your time in Berlin! Markthalle Neun on Thursday nights you can join Berlin hipsters for this street food happening. Everything you can imagine from the traditional Berlin meatballs to a Korean “hotdog.” This historic market hall, dating back to the 1800s, is packed with every kind of food and drink vendor. Pay a small deposit on the glass and wander the aisles while sipping your beer or wine. On Friday and Saturday during the day it’s a traditional farmer’s market. During the five years that my husband worked in Poland, I’ll bet we’ve been to Berlin 15-20 times, and we’ve only scratched the surface. In case you don’t have the luxury of living just three hours away, here are my tips for sightseeing in Berlin to help you make the most of your time. This started off as a very long email to a friend who was planning to spend a few days in Berlin after she’d asked for advice on what to see and do. Isn’t the best travel advice, that from a friend who has already been there? These are outings we’ve had in Berlin, some of them many times because we’ve wanted to share the experience with family and friends who were visiting. I often feel overwhelmed by traditional guidebooks with a hundred or more offerings for a city the size of Berlin. I won’t presume to know your special interests and give you sample itineraries that cram six, seven or even eight things into your day. It’s just not realistic. I usually feel that it’s been a full day if we fit in two or three sightseeing activities with a little shopping. You need to take time for meals and to travel between locations. I hope you’ll take some time to sit outdoors at one of the many cafes or coffee shops. That’s an important part of any European experience, watching the people go by and imagining their stories. Go visit Berlin, and take this book with you! What a great little book to read before planning a trip to Berlin.
. . . a useful read whether you’ve been to Berlin before or not. . . 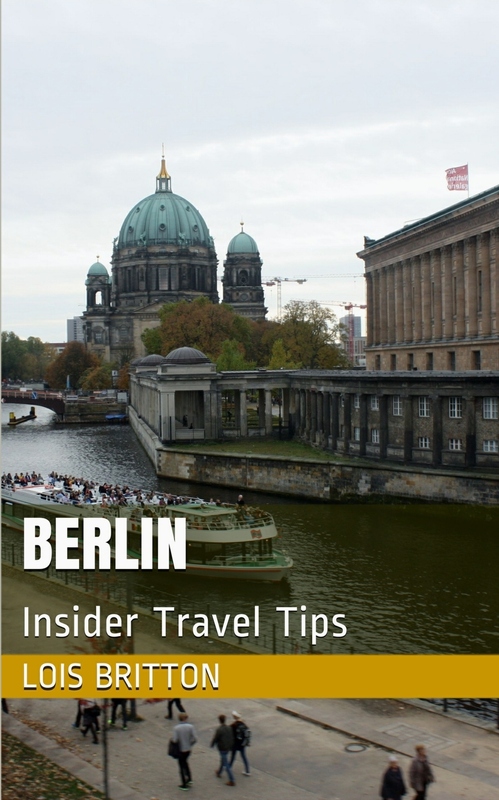 If you’ve bought Berlin: Insider Travel Tips and found the information helpful in your travel or just an interesting read, please do leave a review on Amazon. It really does help a publication get noticed in the sea of millions. Many thanks! Is there a chance you might do this with a Polish book???? ?We are going next year and I have been taking note of some of the places you described in your blog. I have two Polish books in mind, for new or soon to be expats, and the one I’m really excited about will be part memoir, part travelogue, and part cookbook. But it hasn’t progressed beyond my imagination yet. Thanks so much for asking Elizabeth. What cities are you planning to visit? Way to go, Lois! Congratulations: published! Congratulations! As Berlin is on our list for the next few years, we will be getting this to help in our dreaming! I’m sure you’ll have a fabulous time. I look forward to hearing about your Italian adventures!